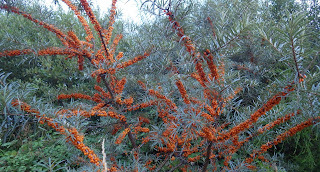 The other evening (Sunday 13/8) I paid a short visit to a nice brownfield site at Machynys, Llanelli primarily to search some thickets of broom for particular micro-moths though nothing of interest was found on that plant. Obviously, I also took the opportunity to see what else was about, but the moths were indeed very `thin on the ground`, with the blustery, rather cool weather probably being responsible. 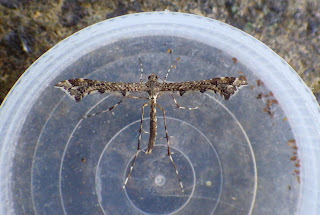 I did spot a plume though, which I think is Amblyptilia acanthadactyla (`beautiful plume`, see below). Above: part of the Machynys brownfield site, looking c ESE towards the golf course (out of sight) and with tansy, wild parsnip, melilots and knapweeds in the foreground sward, backed by a clump of broom. Above: believed to be a beautiful plume? Above: please forgive this non-moth photo, but there are n`t many moths around! 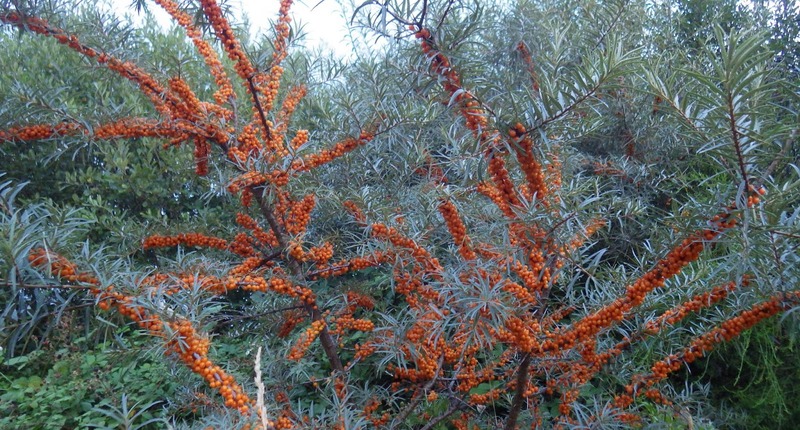 Look at the opulence of fruiting on this sea buckthorn at the Machynys brownfield site. Returning home yesterday evening from my Llangennech jaunt, the skies were cloudier than forecast so I decided to put out one trap in my Pwll garden. 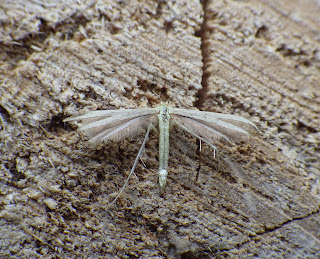 The result this morning was n`t too bad (a fair c.35 species) which included another plume moth, this time the tiny Adaina microdactyla (`hemp agrimony plume`). Above: named after its food-plant, hemp agrimony plume. Other moths included a four-spotted footman (a male) and Ypsolopha parenthesella. 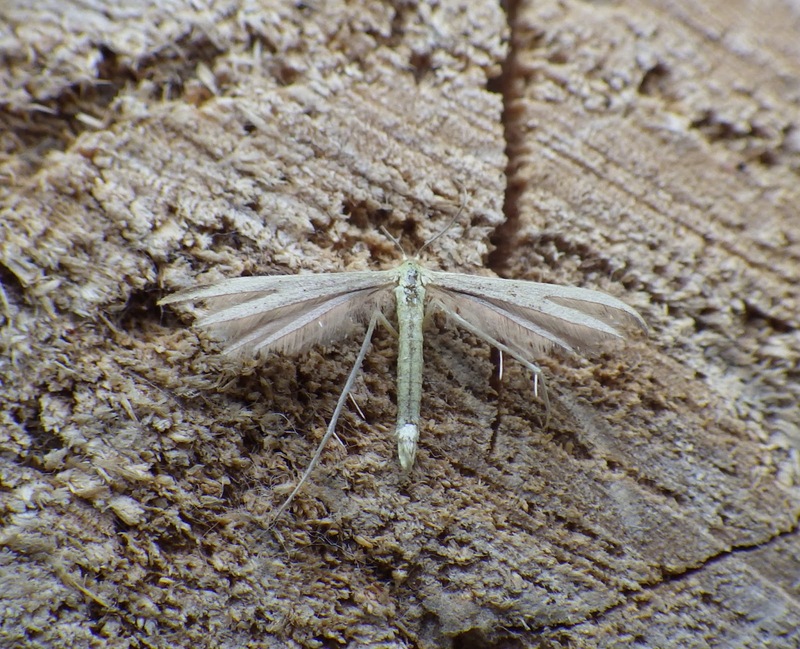 Above: last night`s Ypsolopha parenthesella. The Amblyptilia looks like punctidactyla rather than acanthadactyla - speckly and without warm brownish tints. Thanks George. To part contradict what you say above, it was actually the `brown-ness` rather than grey hues that made me go for acanthadactyla. I too noticed the speckling, but unwisely thought it not significant but now, in retrospect, I can see what you mean and agree with you. The speckling intensity seems to be a good i/d feature. PS. 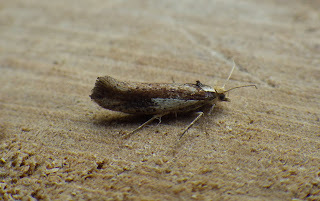 Perhaps hence the `punctidactyla` element given to the scientific name.